More than just a rental ~ it's your home! The design, privacy and ambiance of Shadow Hills Park is unique among rental choices. Shadow Hills Park is a complex of thirteen buildings situated on five acres. Residents appreciate the quiet surroundings, the park-like setting resulting from the large, green landscaped grounds. The entire complex is heated by an underground geothermal system providing a warm and consistent water-to-air heat, individually controlled by each unit. The cost to tenant is only that of electricity to operate the fan - a tremendous saving in the cold winters of Klamath. Each building contains four two-bedroom townhouses; total square feet in the townhouse is 1,258. The spacious rooms of each unit accommodate furnishings without having a cramped "apartment" look. The bedroom closets are ceiling-to-floor mirrored doors, 13.5 running feet in the master bedroom, 6 running feet in the second bedroom. A generous storage area/closet is located under the stairwell. The entry to each townhouse is located at the corner of each building and is enclosed with a patio fence, allowing a private outdoor area for its occupants. 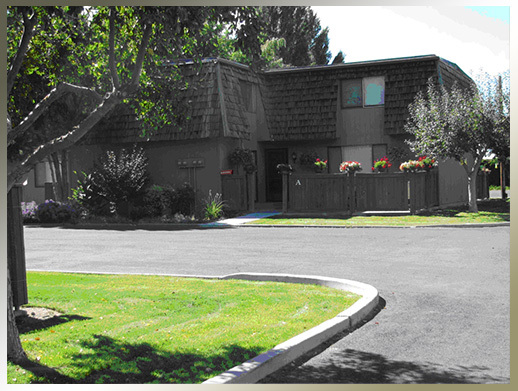 Shadow Hills Park is the only gated rental community in Klamath Falls; wrought iron fencing surrounds the perimeter, cantilever gates secure the drives. Because Shadow Hills Park is located at the 'end' of a residential area it can enjoy the view of open space to the north while still being only three blocks from a bypass for quick, easy access to all other areas of the community. Come visit us and enjoy the songs of birds in the quiet surroundings. 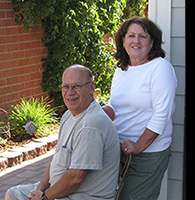 The Resident Managers, H B & Debbie Clark, are there to assist you with any questions that you might have and to oversee the high maintenance that is characteristic of Shadow Hills Park.